Helping companies use data and technology to transform their communications and operations. You want to be data-driven, always-on and customer-centric? It’s easy to put it in a Powerpoint presentation, but harder to make it work in the real world. But this is the world we work in every day, so we can take a brutally pragmatic approach to transforming your marketing. We focus on tangible outcomes. We find quick wins. We make it work. Less ruminating over academic theory, more rolling up our sleeves and making it happen. In the business world, customer journeys are long, complex and non-linear. 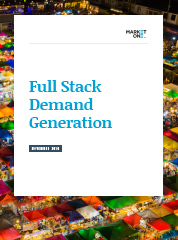 Because we cover the full stack of demand generation skills and services we can help you implement a strategy that optimizes your marketing performance at each turn, taking into account available resources and the harsh realities of executing across multiple business units and geographic markets. A joined-up experience for your buyers, from the first click to the final handshake. "We've worked with MarketOne to develop our demand generation and lead management strategies. They've also been instrumental in transforming our brand messaging. They're an invaluable strategic resource for us." "MarketOne's help in creating our lead development team — structure, comp, training and measurement — was invaluable. The result was conversion above already aggressive targets — sooner than projected." "I’ve worked with MarketOne while at several companies over the last 6 years. I like that I get to work with a stable, strategic team that always take a holistic approach and go the extra mile." Get in touch with our experts and we'll see how we can grow together. Our people don't just map processes and peddle PowerPoint, they stay around to see the strategy through to execution.